When the parts to be heated are within the limits of normal human handling, chamber furnaces are generally used. These furnaces are used for heating up of forging stocks of smaller weights, manual hardening, annealing of small parts. These furnaces come with low temperature and high temperature. Low temperature furnaces are always used for non-ferrous alloys. As the furnace is working under low temperature generally conventional heating is adopted with air circulation fans to convey heat from heaters to parts. They are also used for drying of ceramic and painted parts. In case of heat treatment furnaces, they are used for hardening, tempering of ferrous and ferrous alloys. 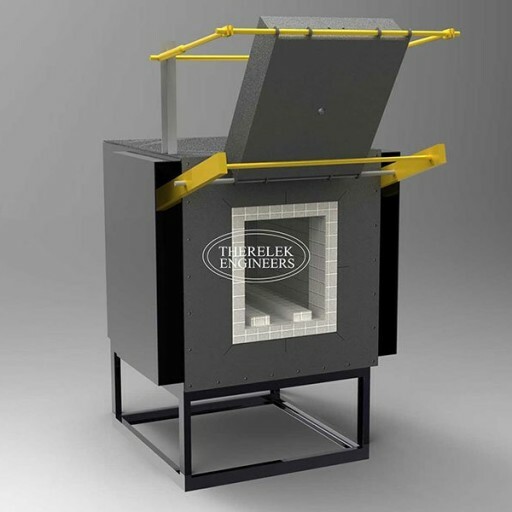 If the furnaces are used continuously the furnaces are made of ceramic bricks of appropriate grade and of the furnace is in intermittent usage, they are insulated and lined with ceramic fiber and ceramic boards. Both the above Low temperature and high temperature are installed with thyristor drives for controlling heat precisely and PID unit to proportionate and control the heating as desired. This chamber furnace can also be upgraded to semi continuous furnace by adding a powered work handling systems, integral quench tanks, slow cool chambers and automatic controls. Chamber furnaces normally made of insulated chamber with an externally reinforced stell shell. Chamber furnaces are used commonly for a wide variety of heat hold cool temperature cycles are required. These type of furnaces require loading, handling and unloading of the material by manual or hydraulic means. It is used in the heat treatment of low volumes of parts (kg/hr.). It is used to carburize material that requires heavy case depths and long cycle times. To process large parts in small numbers, for example, stress relief or annealing of large weldments. To process various parts requiring a wide range of heat-treat cycles that can readily be changed, either manually or automatically.